One lesson you learn early on in your working career is that don't tell anyone if you have a great idea as it won't be yours for very much longer. The business world is cut throat, people are constantly trying to get one over on each other and that old saying “there are no friends in business” is displayed more times in an office than we care to mention. These business ecards show two people standing by a water cooler can cover several situations. 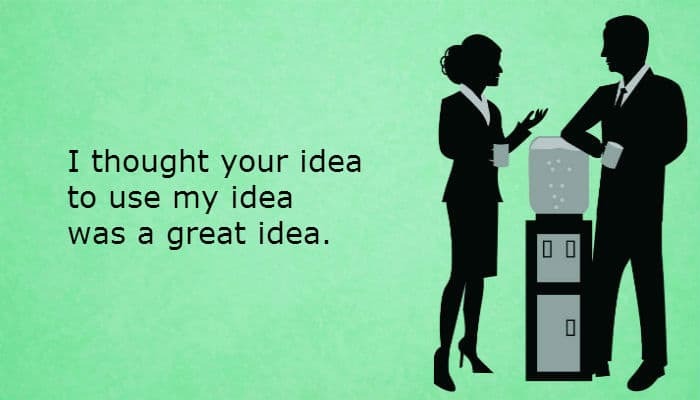 The text reads “I thought your idea to use my idea was a great idea” is loaded with sarcasm. You could send it to somebody who has stolen your idea to let them know you know and you won't be trusting them again. If there is an atmosphere in the office due to this happening you could send it to one of your colleagues with a funny message on the back to break the tension or you could send it somebody who has stolen someone else's idea to let them know how underhand you think they have acted. Whoever you send it to, and for whatever reason, they will get the message whether or not you add a personal message; mission accomplished. Sending ecards for business purposes is most commonly done en mass for the Christmas holiday season so why don’t you check out our Christmas ecards for business?